3D printing is an amazing, innovative advancement that’s ideal for teaching kids about technology and engineering all while having fun and using their creativity to make whatever they want. But despite the technology becoming more commonplace thanks to affordable 3D printers, there’s still a big technical knowledge hurdle kids have to overcome. To help make the technology more accessible and easier for children to pick up, Mission Street Manufacturing has developed a new Printeer 3D that simplifies everything to basically drawing desired shapes on an iPad — and the California-based start-up promises that anyone can master 3D printing in just 30-seconds. See the Printeer in action after the jump! All that’s required for a kid to join the 3D printing frontier is a an iPad, Wi-Fi connection, and the Printeer 3D machine itself. Using an iOS Draw app, kids and adults alike can sketch out objects on a screen using just their fingers. There’s no need to learn AutoCAD or any serious engineering programs. Just create an object as if you were drawing it to life. Of course, Printeer users are free to connect the machine to a computer to create fully rendered 3D models. To make the whole package kid-friendly, Mission Street Manufacturing has gone to lengths to encase its 3D printer in clear, colorful housing. The extra housing helps keep the mechanical bits away from children’s reach — including the motors, pulleys, belts, and sliders — but it’s still transparent for kids to witness and learn exactly how the machine works. The Printeer 3D is currently hoping to launch into production with a Kickstarter that’s less than $10,000 shy of its $50,000 goal. 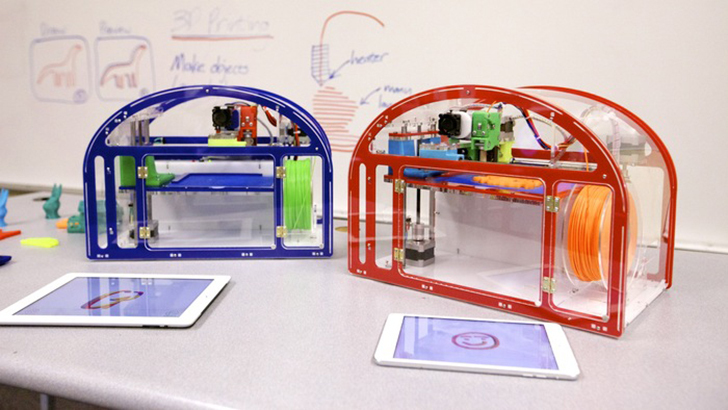 For pledges of $549 parents can get a fully built Printeer 3D in one of four colors with a spool of filament to boot. 3D printing is an amazing, innovative advancement that�s ideal for teaching kids about technology and engineering all while having fun and using their creativity to make whatever they want. But despite the technology becoming more commonplace thanks to affordable 3D printers, there�s still a big technical knowledge hurdle kids have to overcome. To help make the technology more accessible and easier for children to pick up, Mission Street Manufacturing has developed a new Printeer 3D that simplifies everything to basically drawing desired shapes on an iPad -- and the California-based start-up promises that anyone can master 3D printing in just 30-seconds. See the Printeer in action after the jump!